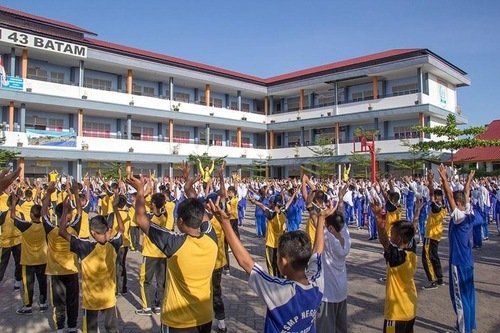 Falun Gong practitioners visited the 43rd High School in Batam Island, Indonesia to give a presentation on this ancient Chinese mind/body practice. The group was invited back to this school a second time, after giving a presentation there two years ago. 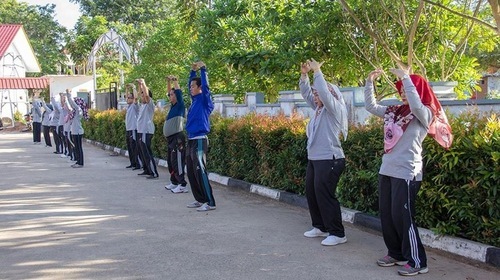 Students learning the Falun Gong exercises. 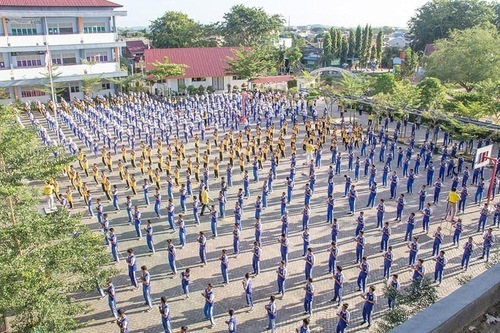 To a group of 800 students, practitioners talked about some of the spiritual principles taught in the book, Zhuan Falun, the main book of Falun Gong. They explained that the core principles of the practice are Truthfulness-Compassion-Forbearance. Afterward, they demonstrated and taught the exercise movements. Faculty members learning the “Falun Standing Stance” exercise, the 2nd of the five Falun Gong exercises.